Many deaerators in the past have been built with vent piping that protrudes through the water box to the external portion of the heater allowing the oxygen to be eliminated from the deaerator. 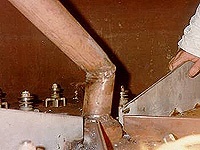 Many manufacturers provided a dog leg type vent with a miter joint which typically fails due to inadequate welding where the vent pipe supports the valve plate. This whole design can be solved by making typical structural modifications.